Tissue Viability Nurse working in an NHS community trust. This is just a few thoughts from reading through the plan and applying it to my knowledge and current experience of working within the NHS today. It is a critique, after all previous NHS plans have brought us to where we are now, a fragmented system being constantly reorganised, with money leeching out wasted on procuring contracts and rebranding. So this is a careful perusal of the proposals and does not make the assumption, as I always did previously, that the first consideration is for the patient. On page 6 the plan states that redesigned hospital support will be able to “avoid” up to a third of outpatient appointments “saving “ patients 13 million trips to hospital. I am not sure that this is a good thing. This assumes that out patient appointments waste patient’s time. However it would also be interesting to know how many out patient appointments identify issues that lead to medical intervention that may not have otherwise been identified. I feel this is a further withdrawal of safety nets for patients. Fast support for people in their own homes as an alternative to hospitalisation is also discussed. While many patients do fare better within their own surroundings there needs to be much more investment in community teams and services including more comprehensive hospital at home teams to deliver this and also it must not be forgotten that there are still many treatments and tests that can only happen in a hospital, and that patients are still going to be on their own without medical practitioners at hand for large periods of the day at home. Some patients will not be able to manage at home no matter what is in place and so access to hospital beds , more than we have available now, is still of paramount importance as is adequate access to rehabilitation facilities and respite and care home placements. The personal health budget is mentioned on page 7 and again later in the paper so I will discuss this later. “Same day emergency care” is proposed to be encouraged. This is not actually what it sounds like at all. This is proposing targets of NOT admitting emergency cases into beds but treating and sending home within 24 hours. This doesn’t sound safe to me. A genuine emergency patient is likely to need to be kept under observation following treatment and 24 hours is a very short period of time. We already see patients discharged too early into the community having to be re admitted. This can be potentially life threatening and certainly is a nuisance for all concerned. This proposal is not specific as to what cases it refers to and if it’s a blanket idea sounds frankly ill thought out and dangerous. In the community we don’t have nurses available in a patients home 24 hours a day they may visit daily or even once or twice a week. Not all patients live with other people or have support nearby. There is not life saving equipment in the home. Patients should not be being rushed out after treatment, particularly emergency treatment. In chapter 3 there is a claim that childbirth care is “the best it’s ever been “. There are no statistics to back this up. There have been maternity units closed up and down the country, women in some areas are having to travel much further to reach a maternity bed. This could only have had a detrimental effect. I would therefore like to see the statistics behind this claim. There is also a similar claim about cancer survival. We are hearing accounts of delayed diagnosis and treatment, and patients who have lived here most of their lives denied treatment or being charged. So again I would like to see the statistics behind this. On page 8 it says university places for nurses and midwives are oversubscribed. However most reports I have heard have been that there has been a drop in applications since the bursary was discontinued. Perhaps it is because there are now less universities offering courses. I would like to see statistics backing this claim. It is known that we are training less nurses and that we are facing a shortfall. On page 9 “In order to deliver for taxpayers the NHS will continue to drive efficiencies”. I would suspect the taxpayer would like an efficient service but not a cut back to the bone service. We are already cut to the bone. It goes on to talk about major reforms to financial architecture, payment systems and incentives. This sounds like being incentivised which is not an efficient way to deliver the best care in best interests of our patients. It may also be referring to introducing further charging. On page 10 we have “ remove the overly rigid competition and procurement regime applied to the NHS”. This could be a good thing. If it were an end to these practices it would be the ability to return to a nationalised system. Alternatively it could allow further privatisation and to remove safeguards. Integrated care systems are to have been implemented everywhere by April 2021. On page 11 1.3 an example of possible future integrated working is given where “the physiotherapist helps with anxiety and depression “. This is not a proposal that can work. No discipline will undertake the remit of another; as professionals we are all highly trained in our own disciplines. They are not interchangeable and a physiotherapist would not have the competence in this area any more than a lay person. It also has a worrying statement about the “ pointless “ call backs for patients with long term conditions. These are not pointless. These are opportunities to monitor, to change treatment as necessary, to practice preventive healthcare and to keep patients as well as they can be. “The greater efficiency and lower cost to the taxpayers of the NHS means it has a lower level of hospital beds than other European countries “. I think taxpayers would prefer a slightly higher cost and more hospital beds. We have had frequent scenarios of ambulances queuing outside hospitals up and down the country because all the beds were taken. We have patients discharged too early and in the middle of the night because there is a demand for beds. I work in the NHS. I don’t think it is being run efficiently and I believe the waste is the marketisation and privatisation of contracts. This is highly inefficient. The plan also states that sicker patients are being “ successfully “ looked after without hospitalisation. This doesn’t mention decentivising GPs to admit patients to hospital, patients being denied funding for treatment, the difficulty we now face in the community trying to get our patients into hospital and the rising mortality rate in this country. Personally I am finding it quite a frightening place to work in the community now. On page 22 “same day emergency care” is again mentioned. There is a target to raise the rate of acute admissions discharged on the same day from “a fifth to a third “. This seems arbitrary and how can this be achieved and it be assured these patients are safe? Figure 5 shows a graph but does not give enough context to make sense. This is supposed to show the “ differences in where patients are discharged compared to what would be best for them “. It doesn’t say who says the outcome would be best for them or why. P25. Who is saying it is best outcome and why? On page 25 personalised care budgets are discussed. While it seems a good idea what happens if the patient reaches the end of their budget? 1.45 It is seen as “ successful “ to “ constrain referral growth “ and outpatient appointment visits are seen as negative. Outpatient services are to be “ reformed “. If this is to drive digital appointments I am concerned that not all services can be delivered this way. Face to face appointments can not be beaten in diagnostic assessment. We have a growing elderly population, many of whom are excluded from the “ digital age”. Furthermore if the plan is to reduce hospital admission, wouldn’t out patient services grow as a result? 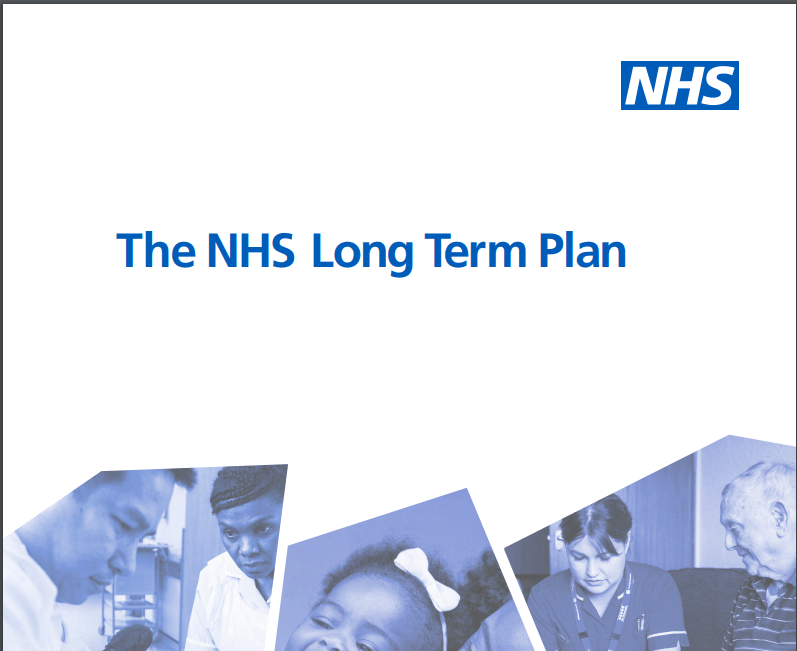 On page 30 the plan talks about longer NHS contracts with all providers. There is both positive and negative in this. This could lock in a private provider or badly performing provider. However equally staff would welcome a break from constant changes, reorganisation and rebranding giving more time to settle in and therefore provide better service. 1.54 “We expect that ICP contracts would be held by public statutory providers “. Could this be used against private companies coming into the NHS? This would be a good thing if so. On page 32 blending health and social care budgets is mentioned. Health and social care integration could be a very good thing if done properly. However social care is charged to the client. Local authorities provide some funding to the most needy so it is means tested. This could be how charging is introduced into health care. It is clear that the integration is for management purposes and pooling of budgets and that patient care may not have been at the forefront of making these decisions. This focuses on prevention. Prevention is a very laudable aim. Budgets in healthcare have been cut to the bone and so health prevention has been a casualty of these cost cutting exercises with services such as Sure start axed and Early intervention mental health services cut back. If there were to be an increased budget for prevention which did not take away from other areas of work this would be welcomed. However from reading this chapter I am far from convinced that this is not going to result in a reduced provision of actual face to face services. 2.6 discusses Integrated Care systems again. This is a very pleasant sounding term until you understand it is based on the American model of healthcare- the model that bankrupts citizens. This section says that the NHS is to move from “ reactive care” to “embody active population health management “. It is good to be preventive rather than reactive; however in healthcare dealing with humans there are times we need to react! I am concerned this will turn into a DWP style hostile environment for the sick, preventing them from accessing treatment and bullying them into “self care”. Page 38 talks about air pollution. This is indeed a very serious concern and no small health matter for many people. There is a pledge for the NHS to “ cut business mileages and fleet emissions by 20% by 2023 -4. I am interested in how this is proposed. While certainly many managers and executives can utilise technology such as telephone conferencing and video links, this is not the case for frontline workers. I am concerned the “ fleet “ is mentioned. Is this a pledge to cut ambulances? How can we make promises around “fleet “ emissions if the “ fleet “ is increasingly in the hands of private providers? Virtual appointments are also discussed. These may work for some services but for some services and some patients face to face appointments are absolutely necessary. Care must be taken in not bringing a “ one size fits all “ approach and I am afraid from previous experience this will be done without understanding the services involved. Childbirth is the safest it’s ever been. Cancer survival rates are at an all time high. Male suicide is at a 31 year low. Figure 14 shows the infant mortality rates from the Office of National Statistics (England and Wales) from 1921 – 2016. However it is interesting that in Figure 15 it shows a significant increase in infant mortality in the lowest socioeconomic group. This therefore shows that childbirth is not the safest it’s ever been for the poorest and most vulnerable patients. For cancer survival rates we have the lowest survival rate in Western Europe. Therefore we still have a long way to go to be providing a world class service and cuts in screening and long waits will not be helping as waiting times continue to increase in our highly stretched health service. Deaths from cardiovascular disease have lowered according to the Global Burden of Disease study, however these statistics were also taken just up to 2013 and released in 2014. Since then it would be interesting to see if this was still the case with A and E departments closing and more patients waiting longer for ambulances or admission to a hospital bed. Suicide rates have fallen in the UK in men however they still remain 3 times as likely as women to take their lives, it is clear there is still much to do. In 2010 there were 353,617 patients waiting more than 4 hours before being seen in A and E. In 2018 after a decade of Conservatives 2,778,687 patients waited more than 4 hours, an increase of 686%. In 2010 61,969 patients waited more than 4 hours after decision to admit, before they were admitted to a hospital bed. In 2018 the figure has risen to 614,659 patients, an increase of 892%. In view of this I would say that patients are not as safe as they were in 2010. I welcome the recognition in this chapter that ¾ of the NHS workforce are women. It is recognised that workforce growth has not kept up with need, that there are many vacancies across many roles across much of England. It states that the current vacancy level is “ unsustainable “ and the biggest shortfall is in nursing. However however commendable it is that this is acknowledged, urges and their representatives have been warning of this shortfall coming for years, and that the workforce is aging. And yet there has been inaction for most of this time, and even action which has been detrimental to nurse recruitment, such as removal of the nursing bursary. The statements made are true however by using the words “ unsustainable “ I am concerned they will use this analysis to “ rescue “ the NHS with more privatisation and outsourcing. There are good proposals around addressing the shortfall in nursing by looking at the training. It is proposed that the number of degree courses provided will be increased. The document states 14,000 applicants were not accepted onto courses last year. This assumes all applicants were not accepted due to the availability of courses, however it is important the right applicants are attracted to nursing, it is certainly not for everyone. The taking away of the nursing bursary has also not been mentioned in the plan and certainly at my local university this has resulted in a drop in applicants. The plan discusses the introduction of an online nursing degree. This would include practical placement but I am concerned that someone studying a course which at times is actually going to be unpleasant and traumatic, would not have access to peer support in the same way campus based applicants would. A course like this would need extremely careful consideration. I am not sure a nursing qualification can be undertaken online. International recruitment is briefly discussed. The plan states that many Trusts are now meeting the cost of applying for “settled status “ for their staff. It also advises that changes to Immigration rules in 2018 now exempt doctors and nurses from the Immigration cap. However this doesn’t discuss whether other vital healthcare staff like healthcare assistants, physiotherapists, porters or cleaning staff would be exempt. The leaver rate for nurses increased by 8% in 2017. An increased budget is announced for workforce development. Improving technology would be welcome. There are different systems in place which currently do not communicate with each other. Much of the technology needs modernisation and upgrading. In fact technology is currently often a frustration rather than a benefit costing time rather than saving it.. Therefore better systems and joined up communication would be good. The increased use of apps may be useful if it is not used to lead patients away from NHS providers. However it appears many apps are developed by private providers. On page 100 it says that “ taxpayers investment will be used to maximum effect “. 6.1 explains how expenditure will be increased, however in real terms this increase is still less than previous governments spent. 6.7 discusses reforms to the payment system. Funding will move away from activity based payments to a population based system. This may mean a difference in how services and departments receive their funding if it is no longer based on activities. A “ blended payment model “ is discussed. This is discussed more on the NHS England website. This goes on to explain details of a “ financial recovery fund “. This appears to be about generating profits. It also , concerningly, talks again about “redesigning “ ( cutting) Outpatients, to “ avoid “ up to a third of Outpatient visits. There is a statement about “cash releasing productivity “. This is really concerning. It is discussing, essentially, how to make profit from sick patients. A health service that is designed with patients at the forefront is not a profit driven concern. 6.15”Despite the overall efficiency of the NHS there is still waste and an opportunity to improve efficiency “. I agree with this but I probably don’t think of the same thing when I think of waste, as the author does. I think of wasteful consultations and reorganisations, wasteful bidding for contracts, wasteful rebranding each time there is a new provider, and reshuffling, wasteful market ideology. I do agree that the joining up of primary and secondary care would be of benefit, however again this does depend on the focus here. I suspect this too will not have the patient as the top priority. On page 107 the plan discusses reducing “ non clinical space”. I am concerned about this. It isn’t clear what this means. The Naylor review has legitimised the selling off of NHS land and property. The Naylor report has even earmarked buildings currently in clinical use. The plan says that non clinical space should be freed to use as clinical space but this is often impractical as non clinical space may be completely unsuitable as a clinical space. Generally non clinical space is areas such as offices, training rooms, meeting rooms and restrooms and all of these are necessary. I have lost my own office in the last 18 months and now “ hot desk”. This is not good for personal organisation, for having a meeting space, storing equipment or having a quiet undisturbed place to work. I no longer have a private place to see my team members. Losing non clinical space is not good for staff, or the NHS. 6.21 In 2017 the government announced an allocation of £3.9 billion to “ accelerate estates transformation “, “ releasing properties not needed”. However I do wonder as to whom are the properties “ not needed”. In fact we have a growing elderly population and surely the need for properties would naturally increase, not decrease. 7.14 The plan is to remove “ specific impediments to place based NHS commissioning “. To remove the “ counterproductive effect that general competition rules and powers can have on the integration of NHS care”. To remove “ competition and markets authorities (CMA) duties” introduced by the 2012 Act, to intervene in “NHS provider mergers and it’s powers in relation to NHS pricing and NHS provider licence decisions “. To repeal “ specific procurement requirements in the Health and Social Care Act 2012”. To “Free the NHS from wholesale inclusion in public contract regulations “. To instead “ set out statutory guidance “. All of this is concerning. This is not being done with public knowledge and understanding, and the reason behind removing these regulations, legislation and requirements is not clear or made clear in the paper. Having read through the NHS plan I am not reassured that staff are going to be protected from further fragmentation and reorganisation. I am not assured that this is not a roadmap to privatisation in fact the removal of regulations and requirements leads me to believe that it is. I am not convinced all statistics give a true picture of the current situation or that vacancy rates and staff wellbeing are going to be properly addressed. I am not convinced that patients will be at the forefront and instead am extremely concerned as profit generation appears to be the actual focus. I am sure there is much more I have not considered, but I do not consider that this plan is going to leave us with the NHS we know and need.